So, this is kind of unexpected. Some of you may recall that Yu-Gi-Oh! 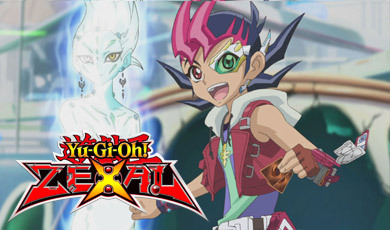 Zexal premiered on YTV back in June of 2012. That’s not much of a surprise as every previous Yu-Gi-Oh! Duel Monsters series aired on the network. What’s a surprise is that Yu-Gi-Oh! Zexal begins airing on Teletoon’s English feed tomorrow at 8:00AM EDT. The episode airing is seventy-four, Attack of the Barbarians: Part 1 – which was the first episode under the Yu-Gi-Oh! Zexal II branding in Japan. Right now it looks like this broadcast will be in addition to YTV’s Friday and Saturday runs of the show. As far as I can tell, this is the first fully Japanese produced series to air on Teletoon since the conclusion of Mega Man NT Warrior in the mid-00s. I should mention that Attack on Titan is premiering in the US on Toonami this weekend. If the manga sales and general buzz around the property are any indication, the show’s going to do very well. It wouldn’t hurt to Tweet Teletoon, Cartoon Network, and Adult Swim with #AttackonCanada to show your support. It’s been a long time since the last Japanese property with potential to go beyond just anime fandom. Thanks for the heads up! That’s really strange, I believe this is the first time in recent memory that a single anime series is airing on three channels simultaneously (CW, YTV, Teletoon). One tiny error – the episode is called “Attack of the Barians”, not barbarians. With Corus owning Teletoon and CN entirely now, we could see more anime programming moving from YTV to Teletoon in the future. Redakai has already turned up on Cartoon Network, with North American premiere episodes of season 2 airing Monday-Friday at 7:00am starting next week.